Further south lies Playa San Francisco, an inviting 3-mile stretch of sandy beach that’s considered the longest and finest on Cozumel. 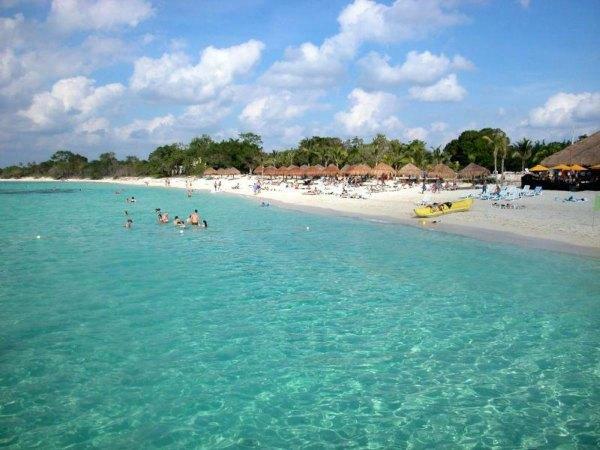 Playa San Francisco is actually two beaches, Playa Maya and Santa Rosa. One tip: During high season (winter USA), this beach can get crowded with cruise ship passengers. You know you’ve found the best when the locals also join you at the beach. They’ll be there on Sunday, eating fresh fish and enjoying live music. Now because of the popularity, it’s the most expensive beach on the island. Playa San Francisco offers all the amenities: two outdoor restaurants, a bar, dressing rooms, gift shops, volleyball nets, beach chairs, and a variety of water-sports equipment for rent. You will see divers using Playa San Francisco as their jumping-off point for the San Francisco reef and the Santa Rosa wall. The abundance of turtle grass in the water, however, makes this a less-than-ideal spot for swimming and snorkeling. Resort construction in the area is changing the face of this one-time idyllic beach.